We’ve had a weekend off, staying with friends at the Old Mill in beautiful Braidwood, and eating some nice nosh at Torpeas. Funnily enough our absence has coincided with the best ever daily stats on the blog (not that we concern ourselves with such -ooh look it’s just gone up again). So a big thank you to all the bots responsible for taking us from a daily average of about 5 to an all time high score of 200+. So, Happy Chef. A Newtown institution if ever there was one, and Valentine’s Day as well. 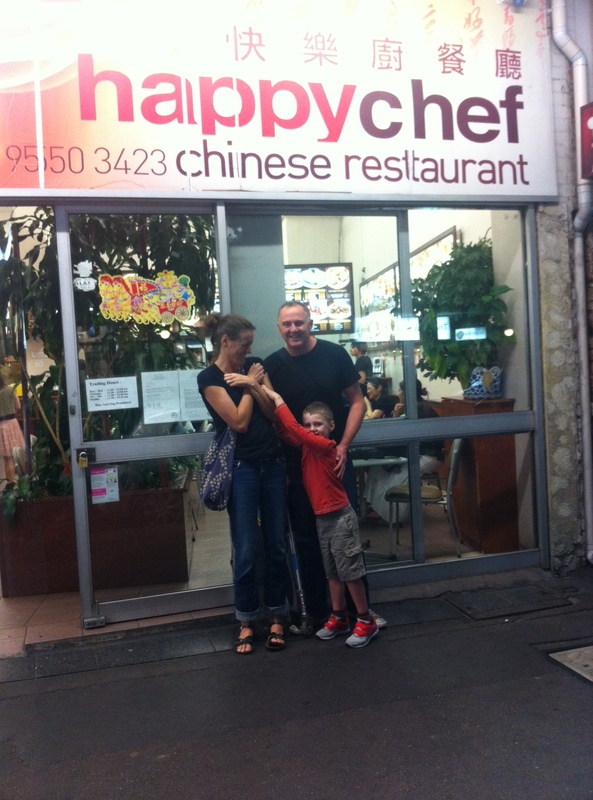 Happy Chef is a no-frills, old fashioned suburban Chinese eatery. You order and pay at the counter from the extensive pictorial menu displayed overhead, take your number back to your table and soon after, a white clad waiter brings you plates of food. They do a big business in takeaways too. A lot of the customers seem to be locals and regulars, chatting away to the staff about kids and the new school year. The decor is all fluoro lights and hard surfaces which makes for a lot of background noise, especially as the early crowd includes plenty of children. Luckily I am saved from having to call on Scott Morrison to come and protect my distant borders from zombie refugees, by the arrival of Paul and Strop. They are soon followed by Ash and the Nedsky, who soon spots a couple of school chums at another table and in no time at all the three of them have merged into an informal gang of Happy Chef doormen, spruiking the delights of retro-chinese food to passers-by on King Street. The street is packed tonight, the normal friday night crowds swollen by hopeful couples, and by desperate single men and women striding purposefully along the footpath, clutching a variety of last minute floral arrangements. Somewhere in amongst all the arrivals and greetings, my prawn entree/place-holder arrived. Four fat, battered prawns with a dish of sweet and sour sauce. It’s a long time since I had sweet and sour anything, and I am not ashamed to say that I really enjoyed this trip down memory lane. The sauce was pineappley and sticky, the batter was crispy and the cholesterol-laden prawns were plump. Yum, paint me double-happy. Strop took some convincing but, Paul and I eventually convinced her that she needed to embrace the retro-chinese vibe. It was about then that Ash informed us that one of her friends refers to Happy Chef as Happy Death. On this note we all began craning our necks to check what else the menu offered. We eventually decided on salt and pepper squid, XO beans, sweet and sour fish, emperor chicken, fried rice and veggie char kway teow. While Strop and Paul went to do the ordering Ashleigh and I discovered that Nedsky had been quietly cornering the market in toothpicks, and was putting them to use, doing vampire impersonations for the passing pedestrians. 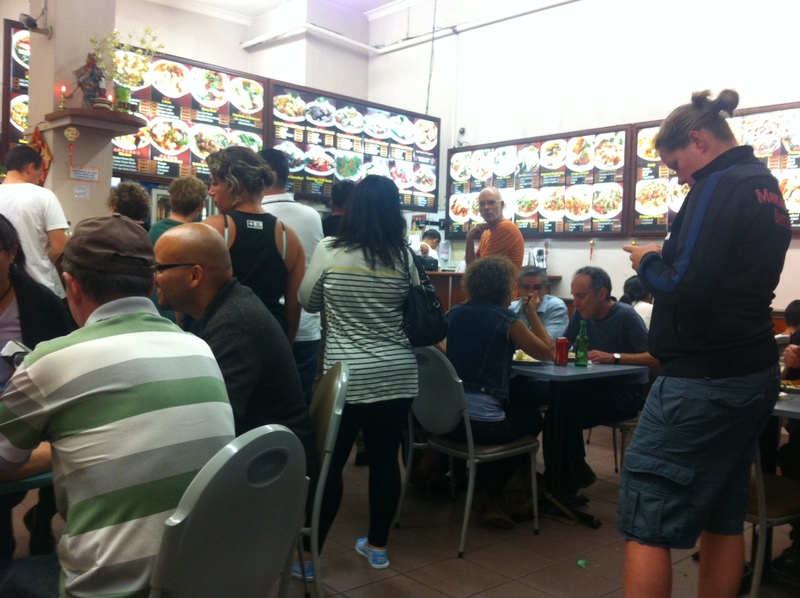 The crowd at Happy Chef is older than at most of the King Street eateries we have been to, mostly families and locals. Paul is perplexed by the lack of hipsters until he makes a sighting near the loos, just a brief glimpse of a beard and a checked shirt, but enough to confirm the presence of these shy creatures even in this un-trendy environment. The food was better than I had been expecting, tasty, crunchy and yummy. The only disappointment was the bean dish, which I thought was a bit over-seasoned. The sweet and sour fish was really good. Paul was convinced that the pineapple chunks were fresh not canned, which I thought was a bit at odds with the whole 70s retro-Chinese vibe, and Ash pointed out that the sauce didn’t have quite the right intensity of lurid pinkness that she remembered. Still there was none left over. The emperor chicken was good too, nice and crispy with another tasty sauce. By this time we were on to our second round of Tsing Taos and Strop was getting a bit more generous with her illustrative hand gestures. She described her days adventures in Parramatta by knocking over any beer bottles within range. After her third attempt to clear the table she did confess that “Oh yes, and I did have a cocktail before I arrived.” Must have been a good one! On the way home Strop and I made our way through the King Street crowds and were entertained by a skinny girl Irish dancing on the front porch of what used to be the Old Fish Cafe. She clattered away on a piece of board, arms clamped to her sides, legs going in all directions, while an over-weight dachshund showed its appreciation by barking enthusiastically. This is what Newtown is for. I have read all of your posts and find them to be highly entertaining. I stumbled upon it via the review of the Fab Fat Belly Kaf. I totally agreed with the review, so I read the rest. Think that I have eaten in King Street about twice. The last time my pragmatic friend complained because I wanted to look at every menu. So if ever I want to eat in King St again, I’ll be well armed. Glad you are enjoying it Sandy, and hope we can be of some use as well as having a bit of fun. 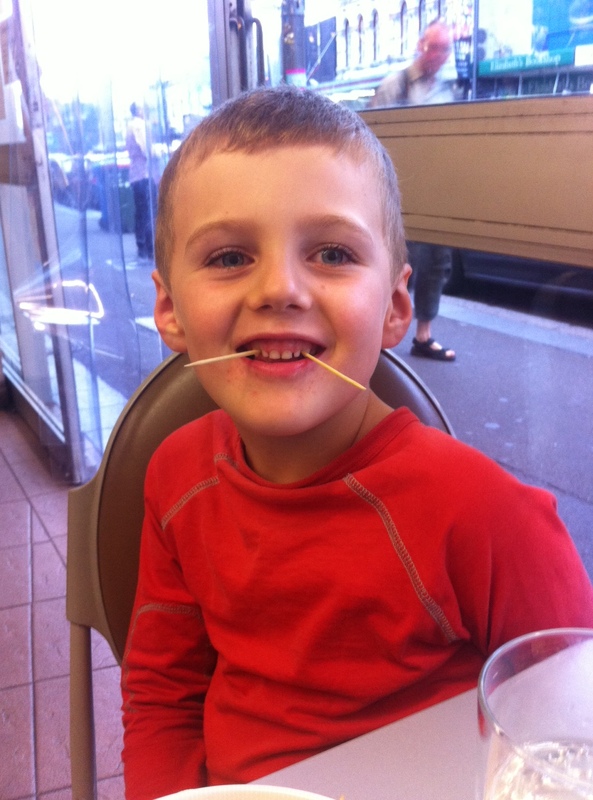 We’ve eaten at Fat Bell Kaf 3 times – it’s a must do whenever we’re up that way now. by the way, the cocktail I had before dinner was at the Parramatta Lunar Bar, tasty, but fairly weak. Gung hei fat choi!